You are currently browsing the category archive for the ‘ArtCon’ category. In November 2015, Kettle Art was offered the opportunity to curate an exhibit to spotlight artists of Art Con 11 who caught our eye. The tricky part was selecting artists who had never before exhibited at our gallery. This exhibit is the result of that sneak peek of talent. This show runs through Saturday, January 30th. and more will be announced in the near future! 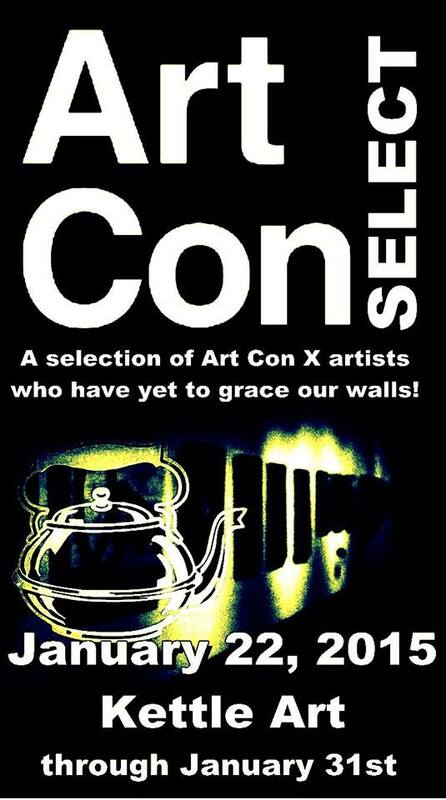 In November 2014, Kettle Art was asked to preview the art work of Art Con 10 and offered the opportunity to curate a spotlight of artists who have never shown at the gallery before. This exhibit is the result of that sneak peek of talent.